1. Super weatherstrip & gasket adhesive. 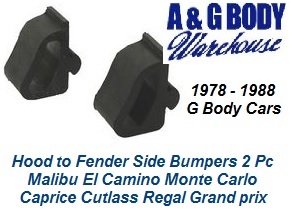 For use on 1978 - 1988 G body models. This is a 2 pc hood to fender rubber bumper kit. The guide and center the hood as you close it and keeps the proper gap between the fender and the hood as the fender runs along the hood on the sides. Use the shipping drop down menu below to select shipping location. Xtra Grip 2 Sided Adhesive Tape, for Automotive and Garage / Show Uses! Battery Tray Acid Liner Battery Secure Great for auto or garage!